If you missed the first part of this long essay, it is here. I am looking at what has happened in the last ten years with respect to the central assumptions of the anthropogenic global warming (AGW) scare, about which I wrote a decade ago. You can read the original essay here. Assumptions #1 and #2 have already been dealt with. 3. Is the warming caused by our burning fossil fuels, clearing the forests and other activities? There is no doubt that CO2 accumulations in the atmosphere are increasing, and since we are burning a lot of fossil fuels, which release CO2 when they are burned, our activities are part of the cause of that rise. But does that rise lead to global warming? Theoretically, it does: more carbon dioxide leads, at least in the laboratory, to the trapping of more heat in the atmosphere, and thus to a higher temperature. But theoretically, also, each rise of a given amount of CO2 has a logarithmic effect, such that further increases have less effect. It is conventionally assumed that CO2 levels as the Industrial Revolution began (mid 18th century) were at about 280 parts per million. In theory again, and ignoring ‘climate sensitivity’, a doubling of CO2 would produce an increase in global temperature of about 1 degree C. Now to gain that one degree increase CO2 levels would need to be at about 560 pp. They are presently (ignoring seasonal changes) at a little over 400 ppm. When I wrote the original essay CO2 was at 385 ppm. In ten years there has been a rise of a little over 15 ppm. If we assume that each decade will produce an increase of 15 ppm, then it will be about a hundred years from now when we reach the doubling. The next doubling (from 580 to 1160 ppm) would, using the same metric, occur three or four centuries later. This simple arithmetic suggests that there is no need to worry about an increase in CO2, and indeed that would be the case were it not for ‘climate sensitivity’, a notion introduced by climate scientists to get their models to run properly (ie. show a lot of warming). The premise is that more heat retained means more clouds and more heat and therefore more rain, and so on until (in some examples) we get runaway warming, the boiling of the seas and other catastrophes. 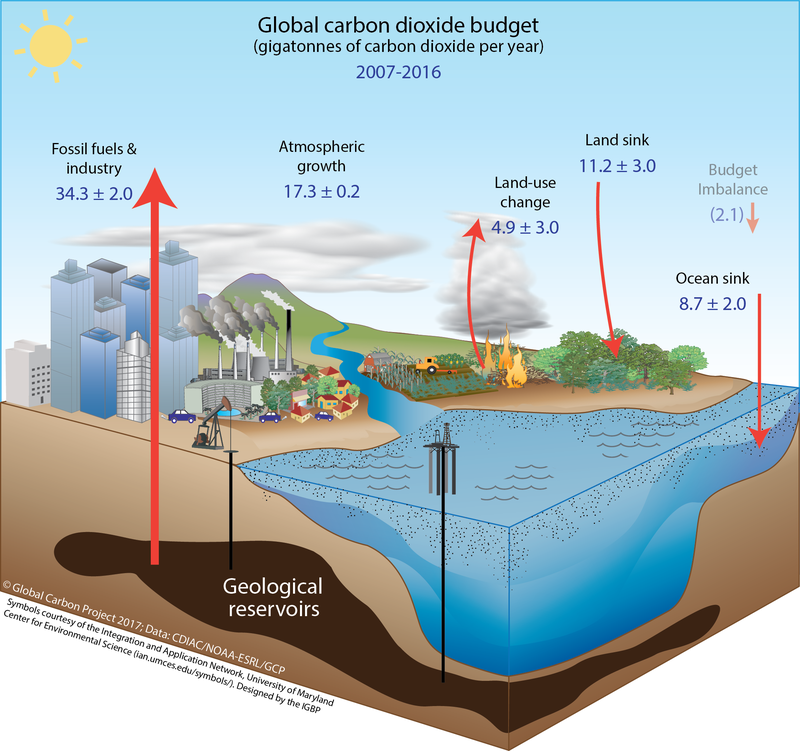 The IPCC has stuck to this view over the last twenty years and more, and offers a range of estimates for ‘climate sensitivity’ of 1.5 to 4.5 — meaning that a doubling of CO2 might lead to an increase in global temperature of 4.5 degrees C. It has maintained that range over that time, saying that it is too hard to pick up a specific number. A lot of attention has been paid to ‘climate sensitivity’ in the past decade, and for good reason. Indeed, I’ve written about it about a dozen times (e.g. here).Without a good deal of climate sensitivity, there is no real AGW scare. The following diagram, courtesy of Jo Nova, lists the published papers on the subject, showing their estimate, and the publication date. The blue line deals with what is called ‘transient climate response’, or what will happen in the next couple of decades. The red line deals with ‘equilibrium climate response’ — what happens when everything settles down, perhaps a century from now. You will see that both lines converge towards unity, because the more recent publications present much lower estimates. Unity, of course, means that a doubling of CO2 leads to a one degree C increase in global temperature. I should add that an equally plausible view of it all says that more heat means more clouds, which mean greater reflectivity from the greater cloud mass, which means a reduction in temperature reaching the earth, and therefore a negative feedback, akin to the work of a thermostat. Since the temperature of the earth, as measured by palaeontological proxies, suggests that for the most part temperature remains within a fairly narrow range, there is obviously something to the negative feedback hypothesis. On the face of it, human contribution to global warming seems to be slight, though real. 4. Is the global warming likely to lead to a dangerous increase in sea levels? I have been writing about sea levels a lot in the past year or two (in fact a dozen times in six years, most recently here), and have yet to be convinced that there is anything to be worried about with respect to our country in the slow rise in sea levels that has been occurring for the past few thousand years. Tide gauges are the best indication of what is happening locally, and they present no real cause for alarm in most parts of the world, on average about 1.7 mm per annum over the last century or so. Sea-level changes can be misleading, because land can also rise and fall. But southeastern Australia is geologically stable, so the tide gauges there are decently reliable. Yes, satellite altimeters show an increase in sea level of around 3mm per annum on average, and even such an increase, if it were real and everywhere, would allow ample time for ordinary defences against the sea. But calibrating tide gauges and the satellite readings cannot yet be done without heroic assumptions. Judith Curry’s long series on sea levels at Climate etc (perhaps start with this one, which discusses satellite altimetry) is compulsory reading if you want to get into this subject. Her last essay concentrates on the US, and her conclusion is that sea-level rise is real, and that communities likely to be affected should prepare for it. But in her view CO2 is not the real problem, while land use, population movements and vertical land movement are much more important. The sea level rises for two principal reasons. As the oceans get warmer their volume increases, and melting land ice from glaciers, Greenland and Antarctica plays a part too. The difficulty is that anyone developing a ‘budget’ for sea levels is faced with the need to make other heroic assumptions. Some glaciers are retreating and others are advancing (there are about a quarter of a million of them) while Greenland and Antarctica are difficult field sites. 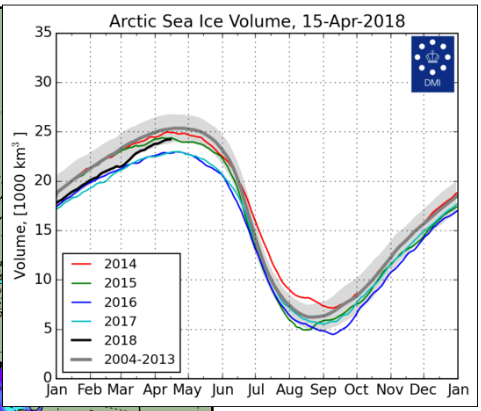 Sea ice is irrelevant. Sea level does not seem an immediate problem for much of Australia. And there is some evidence that the oceans are cooling. Ten years ago claims were made that improved computer power and improved modeling would solve all the problems of prediction. We don’t hear such claims so often now, and in fact, while there have been some advances, the fundamental problems remain. There are three of them. The first is that wherever we live we really need to know about our own particular climate, our own precipitation, our own floods, droughts and fires. But that is hard to do, because the global circulation models can’t easily be broken down into regional models (though attempts do exist). The second is that the chaotic element in weather and climate has not been dealt with. The third is that even the IPCC admits that our knowledge of clouds and their consequences is ‘low’. It is perhaps for these reasons that IPCC ‘projections’ of global temperature increases in AR4 and AR5 proved to be much too warm. It should be clear now that everything we think we know about climate is surrounded by uncertainty. 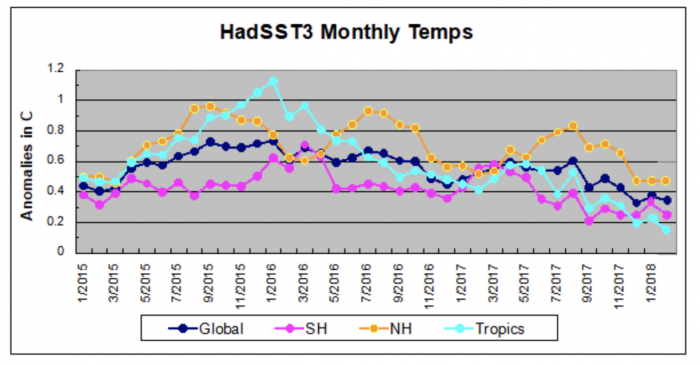 Some of that uncertainty is acknowledged (rarely), but on the whole those who push the AGW scare hardly ever refer to error bars, sampling error, measurement errors, empty cells, and so on. That was true in 2008. Sadly, it remains true today. 7. So, finally, what should we do about it all? Our present Government is trying to do the impossible: somehow organise electricity supply so that it is cheap and reliable, while remaining ‘true’ to the Renewable Energy Target (RET). It simply cannot be done. Coal has become demonised, though it is the core of our electricity system. While we have a putatively ‘conservative’ government, its leading members, including the Prime Minister, are quite unwilling to educate the Australian community about the realities of ‘climate change’. Perhaps they don’t even understand them. There seems to be no real threat from ‘climate change’ to anyone in our country. There hasn’t been any evidence of harm since the late 1980s, when James Hansen told the world that doom was coming. In fact, quite the contrary. Agricultural productivity has benefited from the extra carbon dioxide available, while the planet, according to satellite imagery, is noticeably greener than it was. Extra CO2 allows plants greater vigour without the need for extra water. Supposed links from examples of ‘extreme weather’ to ‘climate change’ have no foundation in evidence, and are bogus. Carbon taxes are not much talked about any more, but the RET is the kind of government commitment that has the effect of a tax, on everyone and on every productive enterprise. It is, quite simply, a kind of madness. It doesn’t matter what Australia does. A week’s activity in China will obviate any reduction in greenhouse gas emissions that Australia makes. If we were true to these CAGW beliefs we would not sell coal at all to anyone. That wouldn’t stop Chinese emissions: China would simply buy the coal it needed from elsewhere, but it would at least show that someone actually took it all seriously. What we have, at the government level, is out-and-out hypocrisy. That we continue to export coal, while retaining an RET, is fatuous. Its only rationale is the fear of losing votes. And there’s the rub. The Labor Party has announced that if elected it will be even sillier, if that is possible, than the Coalition. To repeat: on the evidence, ‘global warming’ is not harmful to people, the planet or to eco-systems now, and for an extraordinarily long time, if then. ‘Climate change’ is not, on the face of it, due to human activity, at least to any noticeable degree. The two terms make up a semi-religious belief, as one can see by reading any Greens material on the issue. That we have endured it for so long is almost incredible. Worse, I don’t see any sign of a quick back-track. Yes, there has been a rise since 2016 (and then a more recent fall). It’s not too difficult to understand, and just a casual glance might make a reader wonder about the imagined CO2 control knob. Don Aitkin, a fossilized fool who writes nonsense about fossil fuels. If you want to comment here, it would be more straightforward, and vastly more honest, to use your own ID. Don Aitkin, a fossilized old fool who writes nonsense about fossil fuels. Don, the above is not my comment. Must be another Neville and Don should be able to check the email link to verify this fact. You are right. Not yours but one by Nga, who went off in a hissy fit some years ago saying she would never return. Well she did, stealing your ID for the purpose. It looks as though the ID problem is back. Are any other commenters seeing another name and email address in the boxes when they want to write something? On your final paragraph, what I don’t get is the contradiction between human caused global warming pretty much accepted now by government, on the one hand, and on the other a policy of relentless population increase as well as ever increasing economic expansion with more of everything. The two positions are surely mutually exclusive. But, doncha know, the Government has commissioned a Report that says (surprise, surprise) that immigration is an unqualified good, and that we would all be poorer without it remaining at present levels. Some of these guys should get out of the house once in a while. it is probable this is all academic. We know that we can produce fusion power and know it can be done. We just need the engineers to build the machine. Who is to clean up the wind turbines, as far as I know and unlike miners, they have paid no bond to remove the ghastly contraptions. Farmers and landholders cannot afford to remove both the metal and the concrete. perhaps we should insist on a bond be paid for all the turbines, $250,000 each. Seems fair as miners have to pay, quite rightly, to return the land they wreck, to as near original condition prior to mining. Good point. Yes, they are in contradiction. But some of government policy is like that: two departments pursuing contradictory goals, apparently unaware of each other. But the theory is that cabinet government should prevent or rectify such contradictions. But it’s one thing for government to run contradictory policies. It seems that no one ever notices. The advocates for producing and selling more and more stuff travel more, support nighttime sporting events powered by coal fired power stations, etc. etc. No one ever notices such contradictions, or perhaps turn a blind eye. It basically means that very few of the advocating warmists really believe their propaganda. Despite any and all arguments to the contrary, Albert Bartlett demonstrated years ago (in relation to his own city of Boulder, Colorado) that our dear leader’s mantra of jobs and growth is ridiculous. The people know it – ninety percent of comments about immigration, in any forum, are negative. Point to any country in which a flood of immigrants has made the people richer, or their living conditions better. Not even Australia. Only the political class are blind, and wilfully so. Let’s be honest and just say that every govt on the planet is dishonest and are totally hypocritical about the use of and export of fossil fuels. And their attempts at so called mitigation via Kyoto and now Paris COP 21 are just BS and fra-d. If this isn’t true then we must conclude that not one govt on the planet understands very simple first grade maths and science. The IEA makes it very easy to understand with their pie graphs, but I find it so hard to get anyone interested enough to show the graphs to the public. It’s a wonder Lomborg has any hair left on his head after decades trying to get this very simple data to the public. Even the Bolter isn’t interested. What is their problem explaining this stupidity to the public? Don or anyone have an explanation for this? Sure beats me. It is proposed that visitation by extraterrestrial spacecraft (UFO) alters the electromagnetic properties of the earth, its atmosphere, and its oceans and that these changes can cause global warming leading to climate change and thence to the catastrophic consequences of floods, droughts, severe storms, and sea level rise. An empirical test of this theory is presented with data for UFO sightings and surface temperature reconstructions for the study period 1910-2015. The results show strong evidence of proportionality between surface temperature and cumulative UFO sightings. We conclude that the observed warming since the Industrial Revolution are due to an electromagnetic perturbation of the climate system by UFO extraterrestrial spacecraft. SD, please tell us the peer-reviewed journal that printed this. It looks like a spoof to me. A Canadian reader wonders why I don’t use the Christy/McNider paper of 2017 that showed a TCR response of 1.1 ± 0.26 C for a doubling of CO2, and indeed it doesn’t appear in the graph. My guess is that the graph predates the publication of the paper. He goes on to point out that 80 to 85 per cent of Canada is still covered in snow, well past the middle of April. I was aware of the long lingering winter there, but have to say that at the moment all we can say is that Canada has had a spectacularly long-lasting winter. As a geologist with marine geology experience having drilled offshore strandlines along the East Australian coast line nearly 50 years ago I have to say that both Judith Curry and yourself have a long way to go. At issue is the state of the ice distribution at 12,000 years BP as mapped by the USGS. Compared to the present distribution the volume exchange between the date then and now cannot be explained by the difference between the two ages of mapping. Deep ice core drilling shows no gaps in the ice fossil record – if fact the oddest aspect about Greenland and Antarctica cores is the remarkably constant rate of accumulation regardless of what was going on around them over time. It is clear that these ‘core’ ice sheets are ice accumulators and remain unaffected by climate change. In fact, the deep cores act as excellent repositories of climate, fine particle, gases of all types and so on. It is the rate of change both advance and retreat of the shorelines reported in Professor Curry’s blog is replica of a similar graph produced by Australian geologist many years earlier by RW Fairbridge in 1960. These advances and retreats gave rise to the fossil strandlines that I drilled successfully in the early 1970s. The rates of change, as Professor Curry pointed out were extremely rapid. Ice movements as represented by terminal moraines sites in North America and Europe cannot account for such volumetric changes in ice. I think you have to look at the possibility of the contracting and expanding earth theory first raised to me a oil and gas conference by a Dr Wilson about 2001 held at the University of Illinois. He had some interesting evidence on his poster to support his theory especially using geomorphology in the Gulf of Mexico to support his claims. If this theory ever gains acceptance it will destroy the barely measurable micro atmospheric events that the alarmists rely upon to spread their tale of woe. Finally, the sea level did peak about 2 metres above its current level some 8,000 years ago. I have mapped heavy mineral sand layers well above sea level at Bremer Bay, WA that correlated perfectly with the now mined out high level heavy mineral deposits mined out in the 1960’s on the Gold Coast (not to be confused with the elevated seams on Stradbroke). There were no golden sands before the miners cleaned the place up. Thank you, Ian. I know a little of Fairbridge’s work, but would be keen to learn more. Yes Don, He is quoted in Arthur Holmes Principles of Physical Geology, 1964. The reference to his paper is in Nature 1958 vol 181, p 1518 and also in Scientific American, 1960 Vol 204 (May) pp 70-9. It was a remarkably accurate paper in identifying the main standline second out from the shoreline. The records of the surveys were sadly binned (insufficient space in the NSWGS) though there is some peripheral reporting still on file. Thank you. This is the paper I have read before. Richard Mackey sent me a copy. A brilliant geologist at the time – all this done without access to global information that we can access today. Most astute conclusions. For the past 600 million years, atmospheric CO2 concentrations were generally far above today’s values . From a graph I copied from Scotese and Berner, the values ranged from about 7000 ppm to about 300 ppm. The Ordovician Glaciation occurred when the figure was of the order of 4000 ppm. In two decades, my view is that the idea that CO2 controls climate will seem bizarre. Here’s a link to the Christy, McNider study showing a TCR response of just 1.1 C for a doubling of Co2. This was published in Sept 2017 and is closer to the older Lindzen study etc . How long before the IPCC starts to wake up and why are we paying so much more for clueless S&W energy? Certainly we should be following the NON OECD example and building new reliable Coal fired plants here in OZ. The risk to the world’s climate depends on climate sensitivity and each decade will not produce an increase of 15 ppm. Population increase and industrial and agricultural increases are the obvious causes. Als climate sensitivity has to include the second effect that a initial warming will produce its own “outgassing” of CO2 plus an artificial increase in water vapour. It is possible to find a CO2 spurt that follows temperature pulses on top of the more general rise of CO2. That’s not really an analysis, Chris, and it doesn’t explain why there was a pause. It is in fact a patronising little piece of no consequence. I agree with you that climate sensitivity is the key. So where do you think it is at, and why? Do you really believe that Chris? If so, can you please tell us how to mitigate your so called CAGW problem? I can always show you the IEA data again to prove the futility of wasting endless trillions $ until 2100. But just think, blith, if the “outgassing” from the warming ocean reduces its “acidity”, it might reduce plant and soil acidity likewise. If indeed population increase is the cause, closing down coal mines and power stations do not seem to me to be the answer. What about closing down immigration instead? But if we close down immigration, Treasury says we won’t be able to afford our electricity. This indicates that CO2 will not increase at 15 ppm per decade. In fact increases of 3pp pa are now possible. Chris, you know no more about the future than I do, but nonetheless you state that ‘CO2 will not increase at 15 ppm per decade’. You mean, perhaps, that if things go on as they are, then CO2 will increase at something more than 15mm. In any case, my 15 ppm was an ‘if’ proposition, not a prediction. And it will take a long time for the 560 ppm level to be reached, and most of the warmth has already occurred! There was no pause in CO2 – there was mundane variation in rate of growth of CO2. although there was a very minor change in slope during the 1990’s. If this is the total impact of the pause in the 1990’s I do not think there will be a noticable impact today from a smaller pause in growth rate. The Barrier Reef Bed-Wetters Assoc. is out in force again today to claim the reef will “never be the same” since the bleaching from el Nino. As nothing is ever “the same” they can justify a sci-paper on it and justify their own superficial existence. Scroll down and see pictures of recovery. At the time you may remember the chairman of the Great Barrier Reef Marine Park Authority, Dr Russell Reichelt, said the authority had withdrawn from a joint ­announcement on coral bleaching with Professor Hughes this week “because we didn’t think it told the whole story”. Well more of the story is now becoming more apparent. But don’t expect these “experts” to rationalise about it. Perhaps that’s an example of what David would call “misdirection”. Jimbo, middle: it might be a big difference if there was any more warming to come. If warming occurs in a logarithmic fashion, then most of it has occurred anyway, from 280 ppm to say 320. There’s not much left. The left hand scale is not scaled so that it occupies the same vertical space as the right hand scale. If you place two series on the same graph, they HAVE to be scaled appropriately. Indeed, a standard ploy used by those trying to “misdirect”. They dynamic range of the blue temperature plot occupies about 33% of the left axis’s dynamic range, while the dynamic range of the black CO2 plot occupies about 78% of its axis. Don, why not take the left hand axis from -1C to 10C, then even more people would believe you! True, but the scales (the y axes) do not have to be the same. Yes. You can always read off the relevant values. A scaled graph of temperature and CO2 concentration by time. 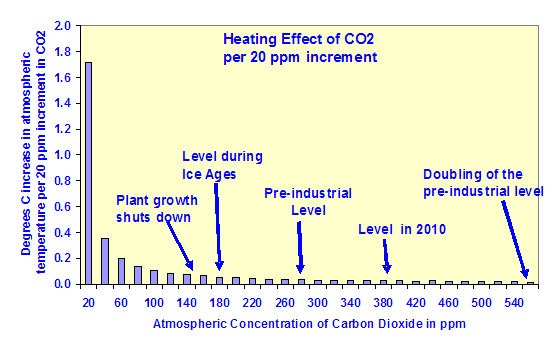 Instead of arguments between angels and pinheads, if the pinheads ever choose to live in the real world, this is the CO2/temp graph they should be looking at. The correlation is oh so obvious…er…isn’t it? Chris, There are many variants of these graphs, and they all start with the same data. The difference is one of presentation. Your ‘scaled’ graph does not have the two axes starting from the same point (nor did mine). What do you think your graph shows? I agree that you can arrange data to show almost anything, if that is your purpose. But it is really difficult to show that CO2 has any kind of direct link to global temperature (always assuming that concept means anything). And unless you disagree that warming through CO2 accumulation occurs in a logarithmic fashion, what is it that worries you? For you and Jimbo, it seems that you believe that doom awaits us. I disagree, and show why. Your arguments and data somehow miss the mark, and yet you are worried. It puzzles me. around 1960 CO2 was 317ppm and temp was 0.6C cooler than around 2011. Over this long period, when natural variations have played out, the net effect is a temp rise of 0.6C for around 70ppm CO2. So if we increase CO2 at 3ppm per year, we will heat the climate another 0.5C by a much shorter period. Chris, ‘science’ might say this if all your assumptions and measurements were accurate. But they’re not. We don’t really know what the temperature was in 1960. You haven’t referred to logarithmic increase at all, so your figure for an increase in Av Gl Temp is almost certainly wrong. And to another matter: the UK Met Office and many other ‘authoritative’ sources do refer to a pause or hiatus in temperature — it’s not just me. We don’t know why it occurred, although there are 70+ proposed explanations for it. The graphed data suggest cyclic influences. Yes, you can say that av. gl temp has been going up, but then (if you trust GISS or HadCRUT) it’s been going up for 150 years or more. Why is it so important for you to hang on to the possibility that AGW is really catastrophic? My figure cannot possibly be wrong if the data is correct. The latest increase in CO2 is over 3ppm per year. We do NOT know what the temperature was in 1960. What we have are estimates. The estimates are of the ocean sea surface temperatures (71 per cent of the globe), where the data come from ships traversing particular routes. If you want good data you have to wait until 1979 and the satellite coverage. All this has been argued out many times here. It’s not the starting point that’s the major problem with your graph, it’s the two y-scales you used. If you compare the range of the data Vs the range of the axes, your graph comes in at about 33% for Temp and 78% for CO2. Chris’s at about 83% and 72%. Why did you do that? If you didn’t create the graph, then ask whoever did. There’s only one reason I can think of, and it does your reputation no good. Regardless of whether you created the graph, or copied it from elsewhere, you attached it to your essay and that speaks volumes of the integrity you bring to this discussion. The news today is that a Queensland farmer has been fined $113,000 for feeding his cattle on rolled Mulga, a practice that has been going on in the area since settlement as it is the reason farmers value this country [for its Mulga drought-proofing] and the Mulga regrows rapidly, ready for the next drought. It is country where it often doesn’t rain for years at a time but it is always drought-proof because of the marvellous Mulga scrub. But I am sure that Australian Universities will now be getting their PhD students to come up with theses to show how equally sustainable Mulga-rolling is [koff]. Dr Roy Spencer looks at the benefits of more co2 on agriculture around the globe. He uses data and compares it to the modelling carried out by the media alarmists. Rainfall is increasing and increased tonnages have been experienced plus the extra co2 has helped as well. Regarding your comment ‘Our present Government is trying to do the impossible: somehow organise electricity supply so that it is cheap and reliable, while remaining ‘true’ to the Renewable Energy Target (RET). It simply cannot be done.’, I would add that the public really needs to understand the pernicious effects of the (L)RET on the viability of our essential baseload generators, which are the linchpin of our previously stable, reliable, low cost electricity generation system. Firstly the LRET scheme forces baseload generators to reduce their output in favour of ‘renewables’ – which reduces both the market share and profitability of our essential, but apparently sacrificial baseload generators. Secondly, as the output of ‘renewables’ generators is and will continue to be subsidised by around $85/MWH, these generators are ‘profitable’ almost regardless of the wholesale price they sell into. The existence of the LRET in anything like its current form IMO is inimical to the survival of our essential baseload generators. On the other hand, the huge subsidy to inefficient, unreliable and intermittent ‘renewables’ generation provided by the LRET ensures that more and more ‘renewables’ capacity will be built and continue to take market share off baseload generators, further reducing their viability. Therefore any attempt by the federal government to ‘fix’ our broken electricity generation market which retain the LRET (or augment / replace it with the NEG) are doomed to fail. Why cannot our federal government understand this? Yes Boy from Tot you are correct, RET is a disaster for our energy system. Today clueless S&W make up just 0.8% of the world’s total primary energy and the IEA projection is that it could be 3.6% by 2040. IOW it is a total fra-d and con trick and costs the taxpayers of the world 1 to 2 trillion $ a year according to Lomborg. This can make no measurable difference to temp by 2040 or by 2100 and we’ll still need coal, gas or nuclear into the future for at least 75% of our energy needs. Of course if fusion become the new energy source then all bets are off. But why isn’t any of this explained to the long suffering taxpayer? Here’s the Lomborg link to the latest IEA report. Don, warming occurs in a logarithmic fashion relative to CO2 levels, hence the often quoted “x° rise per doubling of CO2”. That conclusion is only valid if you believe CO2 rise is linear relative to time. If, by way of hypothetical example, CO2 rise is exponential relative to time, and warming is logarithmic relative to CO2 levels, then warming becomes linear relative to time. 1. you assert CO2 rise is linear Vs time and conclude “there is no need to worry about an increase in CO2”. Warming does indeed occur in a logarithmic fashion, relative to CO2 levels, but that only supports your original conclusion if CO2 rise is linear. 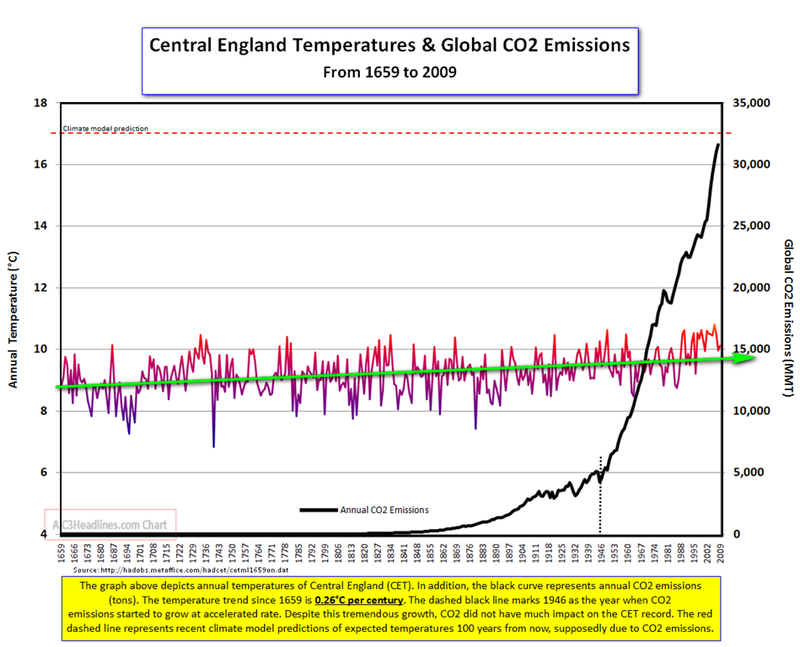 You cannot ignore the shape of the CO2 level graph, it’s critical to all of this. Jimbo tell us what you would do about it and then tell us what difference it would make? IOW what energy source would you choose to replace fossil fuels or nuclear, and what difference would it make by 2040 or 2100? For heaven’s sake Jimbo, what evidence can you point to for the proposition that the rise in CO2 is exponential relative to time? I think you might be verballing me there Don, so I’ll use the same defence you used to defend your data-defying claim that it’s linear: “my 15 ppm was an ‘if’ proposition, not a prediction”. Unlike you, I even gave a clue by prefixing mine with: “If, by way of hypothetical example…”, but perhaps you missed it in your haste? Now I did quote Stacey and Hodgkinson’s finding that the best fit was quartic, so if you want to test your bold claim that “there is no need to worry about an increase in CO2” you might start there. At this stage just about anything would be better than your semi-retracted claim that it’s linear. No verbalising on my part. No data on yours either. A link to the authors you quoted would be a help. I’m happy to read material. Don, I’m trying to explain to you the flaw in your maths argument, you don’t need data for that. Think abstractly occasionally. As far as I know, all these datasets are publicly available, and you keep telling us you’re a numbers man from way back. Download the Mauna Loa data and do you own analysis. That text was published in 2013 so their data-fit is probably due for an update. Show us why you think it’s linear. If you don’t think it’s linear, then tell us what you think it is. One thing is for sure, you need to have done some analysis of the shape of that curve before you can make bold claims like: “there is no need to worry about an increase in CO2”. You made that claim I didn’t. You offered no data or analysis to support that claim. You’re the one with outstanding homework to do. Let us know what you find. Jimbo, the link you provided didn’t come with money! I don’t go behind paywalls. If there is a page or two you can scan, fine. If not, I’ll leave the issue. My suggestion that there is no need to worry comes from the shape of the curve (yes, slightly dished from the 1950s, but pretty straight for the last thirty years, plus the logarithmic effect, plus the clear evidence that increasing CO2 so far has been a great boon to humanity and virtually all life forms. I see no clear sign that the boon will not continue for a century at least, probably two or three. And the catastrophic scare stuff is not based on much more than assumptions and suppositions. Don, you can easily and freely replicate what they did without access to their text. Approach 1: Download the CO2 data, find the best fitting function you can to mimic it, add the usual provisos about uncertainty in past performance being a good indication of future performance (they list quite a few) and then do your logarithm maths on that function to see what expected temperature rises you’ll get, using your own sensitivity settings. Approach 2: Look at a graph of CO2 data, declare it “slightly dished” and “pretty straight” over various time periods (I just looked, it’s not), wave your hands about logarithms and declare it’ll all be fine. One of those approaches is science, the other is faith. I can’t understand why a “numbers man” wouldn’t want to use the numbers? Jimbo, like David, you want me to do some more work. I have enough to do, and have just returned from two weeks away. So, with respect, why don’t you do the work, offer the argument, present the results, add in the uncertainties, and let the readers decide for themselves? Don, I don’t need to do any work, because I’m not drawing any conclusions from the data (despite your earlier verballing that I’m claiming it’s exponential…. I’m not, and I never did). I’m simply comparing and contrasting the two approaches taken, one by a geophysicist and geologist, the other by a political scientist. Both start from the same data, and draw very different conclusions. I believe the methodology taken by each explains why. Don, far be it from me to tell you how to divie up your time, but have you considered spending less time writing, and more time researching? It may change how you view a lot of this stuff. Jimbo, for someone who claims no expertise, and does no work to improve what he has, you are extraordinarily patronising. Jimbo, this is one of your sillier series of comments. Let’s just say that Don did these analyses. What would you say if he came up with a result of which you didn’t approve? Remembering that there are hardly two people who spend their lives doing just these analyses, who actually agree with each other. Don, the one thing your musings on this topic have convinced me of, is that political scientists are 99% political and 1% scientist, and I think I’m being mighty generous with the 1%. All I can say, after these futile exchanges, is that there may well be something in what you say. Jimbo, what you don’t understand is that fewer than 1% of real scientists have any interest at all in politics. Don, if you had half the curiosity you claim to have on this subject, you’d do your own research and I suspect would come to an entirely different conclusion. A while back I pondered what your great great grandchildren would make of all this as they read it in the inter-webby archives. You posited “I hope that they will say that he kept thinking about things”. An equally likely outcome in my view is that they’ll say “He kept thinking about things right up until he got to the things that would have led him to the truth”. I wouldn’t harp on except that it is a recurring pattern. Over the few years I’ve been following this blog, every once and a while people who seem to have genuine expertise in the subject turn up in the comments section. Invariably that ends up with you in a position that defies some combination of the data, maths or physics. Your time constraints elsewhere (understandably) result in you retreating with little more than a polite and grateful I-don’t-have-time-for-this-now acknowledgement. Then a few months later, it’s as if none of it ever happened and you continue churning out the same debunked stuff. Instead of pontificating and waffling [i.e. blithering] jimb, how about giving us just one example of that “same debunked stuff” that Don “churns out”. Jimbo, to repeat, ‘there may well be something in what you say’. Hold on, sonny Jim. Jimbo is not actually saying anything. “I’m simply comparing and contrasting the two approaches taken”. If he wants to take a position, he should say what it is. Otherwise he’s just a race caller. Don’s chart shows a temperature rise from around -0.5C  to +0.5C  for a rise in CO2 of 65ppm. This means there will be another rise, around a full degree, when CO2 increases another 65ppm or thereabouts. This will occur in less than 50 years particularly if the yearly growth averages over 2ppm per year. If the increase in CO2 is maintained at 3ppm per year, then all this will hit us in just 22 years. Maybe there is some other nexus between CO2 rise and temperature – may be a logarithmic aspect, This is canceled if the growth in CO2 is exponential through being driven by global economic growth. Effects may appear to diminish but only after looking at relatively short run trends. If you start at 1998 you can show a period in which temps fell as CO2 rose. If you probe the data carefully you can even find periods where the was little change in temps while CO2 rose. However if you look at all of the scientific data, the net effect is a rise of around 1C for 65 ppm or thereabouts in the long run. Yet more evidence that Greenland temps haven’t changed much since 1880. This just supports the 2005 Vinther et al study that came to a similar finding about Greenland temp trends. Greenland seems to be responding to the AMO cycles and natural variability. It is very easy to show CO2 is exponential over time. The trend (12 monthly averaged) is concave so clearly is not linear. Further if you take the derivative – it is obviously increasing. This means exponential trends are obvious and clear – beyond skepticism. You can corroborate this from NOAA charts I indicated earlier. The northern hemisphere link between rising CO2 and temp rise is quite strong from 1960 or so. You can run the same exercise using Roy Spencer’s data, and there is a clear increasing temp trend as atmospheric CO2 rises. Did you check this trend too, blith:? ABSTRACT: Homicides in England and Wales 1898-2003 are studied against the atmospheric carbon dioxide data for the same period. The Charney Equilibrium Sensitivity of homicides is found to be ?=1.7 thousands of additional annual homicides for each doubling of atmospheric CO2. The sensitivity estimate is supported by a strong correlation of ?=0.95 and detrended correlation of ?=0.86. The analysis illustrates that spurious proportionalities in time series data in conjunction with inadequate statistical rigor in the interpretation of empirical Charney climate sensitivity estimates impedes the orderly accumulation of knowledge in this line of research. Except when there is a cause and effect mechanism. Except when you can EFFECTIVELY ESTABLISH a cause and effect mechanism. There’s been plenty of NH snow this winter and Japan now has a tourist attraction of a 56 feet high snow roadway that is a drawcard for tourists. Incredible photos at the link. Arguments about CO2 can go on forever. As far as I am concerned this entire question of global warming was resolved by a book written years ago by Professor William F. Ruddiman “Plows, Plagues, and Petroleum”. I recommend, strongly recommend, that you read it. It will resolve all this nonsense. Anyway what he said was that there has been a downward trend in the Earth’s temperature since a peak at 8000 BC towards an ice age in about 2000 years time. This is caused by perturbations in the Earth’s orbit, that you can look up on the internet, called the Milankovitch cycle. Now why aren’t we entering an ice age now? As Ruddiman clearly explains, the maintenance of the Earth’s temperature (more or less) is caused by the release of METHANE due to human activity. The major source of this is rice irrigation in China and the Far East. He has carefully enumerated the influence. So the reason why we have not entered an ice age is due to METHANE released by rice cultivation. However Ruddiman did not go into the short term cycles. There are also short term Milankovitch cycles. (There was a downturn in 1866 that froze the Thames). There was a recent upturn between 1970 and 2000, that kicked off the global warming furor – false correlation. Now there is a downturn for the next 30 years. So I can make a very certain prediction. The coming winter will be cold and dry. Next summer will be cold. And so on, colder and colder, for the next 30 years. Yes the seas will get colder. The arctic, antarctic, will get colder. and the number of polar bears will increase. CO2 has little effect on the climate. The solar industry in Germany has become a total train wreck. This country was the poster child for so called renewables but it has failed dismally and the number of jobs have fallen off a cliff as well. Oh and Germany has not seen recent falls in their co2 emissions even though they were a world leader in S&W energy. Like Japan Germany has now started to build new Coal fired plants to service their future energy needs. Surely OZ needs to wake up and ditch the clueless RET lunacy and start building new Coal plants here as well? Prof Ole Humlum will join the UK’s GWPF. He has authored scores of scientific studies on the climate and is sure to bring a breadth of knowledge and experience to his new job. WUWT has a post on the 20th anniversary of Mann’s ridiculous HS study. Willis Eshenbach doesn’t seem to be very impressed with “upside down Mann”. Others underwhelmed by Mann’s HS are Steve McIntyre, Muller etc and many more scientists who were quoted in Mark Steyn’s book. But Mann’s nonsense was paraded by the IPCC etc until they woke up. Here’s his comment. “Michael Mann is a lying liar who spends his spare time lying. Among the biggest is a lie of omission. He was found to have committed a grievous mathematical error in the original Hockeystick calculations (failure to center the data before the principle components analysis). He also neglects to mention that he used post hoc proxy selection. And he doesn’t think it’s worth noting that his method will “mine” hockeysticks out of red-noise data. He is as far from a scientist as a man could possibly be—opaque, dishonest, and completely without principles … in fact, I’d say he specializes in unprincipled component analysis. 1) Believers pretend to possess indisputable truths about the past, present, and future. 2) They refuse to debate its dogma, calling it “settled science” and attacking critics. They try to prohibit scientific research that contradicts this dogma. They call for criminal persecution of those who publicly disagree with the dogma. 3) The alarmist movement has a formal doctrine-setting body — the Intergovernmental Panel on Climate Change (IPCC). They quote these holy texts and use them to justify their decisions. 5) The climate change cult appears to worship the computer models that its members built with their own hands — literally man-made idols. Much of the content of IPCC’s texts comes from these computer models. 6) The alarmists deny, ignore, or distort elementary scientific facts, some of which should be known even to kids eg – Sunspots and the effect of solar activity changes. 7) The alarmists appeal to medieval beliefs that nature has existed forever in some unchanged state. They deny natural climate change, higher CO2 levels in the geological past; natural sea level increases in the current interglacial period; tectonic movement; and the complex trajectory of the Earth’s motion around the Sun. 8) The climate change cult has its own eschatology—calamities, catastrophes, and the end of the world caused by global warming. To avoid this horrible end, we have to repent (i.e., accept the climate change cult dogma), stop sinning (releasing CO2), and generously pay whomever the IPCC or UNFCC will tell us to pay. 9) The climate change cult seeks and actually exerts control over governments. Even worse, it provokes international conflicts over hot air (country quotas to release carbon dioxide). The latest 2018 Lewis and Curry study finds similar low sensitivity for a doubling of Co2. When will the IPCC wake up and take notice of these latest studies ? 1% per year is over 4ppm? The evidence we have shows a 1° C for an approx. 65 ppm increase. This was produced by a rise around 2ppm /yr. Formally, the TCR is a model metric; it’s a way of estimating the sensitivity within a climate model. What happens is that you a run a model in which the only thing that you change is atmospheric CO2 and you do so by increasing it by 1% every year. This kind of of increase would double atmospheric CO2 in 70 years. The TCR is then the change in global surface temperature at the time at which CO2 has doubled (technically, it’s the difference between the initial temperature and the 20 year average centred on the period 70 years after the start). In the real world, this isn’t what is happening; atmospheric CO2 is not simply change at 1% per year and changes in atmospheric CO2 are not the only external factors that can influence surface temperatures (volcanoes, the Sun, other greenhouse gases, aerosols). However, you can still estimate a real world TCR by looking at the net change in external forcing (which is really just a measure of how much these external factors influence the energy balance) and the associated change in surface temperature. Since I’m commenting, can the author of this post give an indication of how much they would expect the surface to have warmed given an increase in atmospheric CO2 from about 340ppm to 405ppm. The final figure in the post would seem to be being used to imply that we’ve warmed far less than expected. Can the author provide some numbers to indicate if this is actually a reasonable inference? I find the whole TCR notion wobbly. But since you ask, let us assume that CO2 levels in 1750 were at 280 ppm, and that doubling the proportion of CO2 in the atmosphere, other things being equal, increases global air temperature by 1.1 degrees Celsius. We don’t have any kind of accurate figure for global air temperature in 1750, and we also suspect that there is some kind of cyclic tendency in global air temperature anyway. CO2 ppm are currently at about 410. What would expect from an increase from 340 to 405? Not much. What has happened in air temperature? Not much. It goes up and down. The climate4you website shows stasis for the most part, unless one sees every rise as being CO2 induced and every fall as natural variation. Not sure I can add much more. Thanks, I’ll expain why I’m asking. In going from 340 to 405 ppm (roughly the change in atmospheric CO2 shown on your graph) we would expect the associated change in radiative forcing to be about 0.93 W/m^2 (Delta F = 5.35 ln (405/340)). If the TCR is around 1.8C, then we’d expect the surface temperature to change by about 0.5C. The temperature axis on your graph goes from -1C to 5C, which makes it look as though the temperature change is very small. In fact, it makes it look as though it is much smaller than expected. However, the temperature change we’ve actually experienced is pretty close to what we would expect. Yes, if all your assumptions prove to be the case, and there is nothing added through any kind of natural variation. We have little data of consequence about CO2 in the atmosphere prior to Mauna Loa, but we do have global temperature data (of a rubbery kind) from about 1850. They suggest that there has been a strong cyclic influence to the present, Of course, the Industrial Revolution may have been the kick-start for the whole CO2 process, though it doesn’t seem particularly plausible to me. And since i don’t know why the so-called Little Ice Age (which wasn’t one really) started, or why the Mediaeval Warm Period finished, I don’t know whether what we are seeing is yet another cyclic effect. But to ascribe the warming of the last fifty years to CO2 strikes me as a leap into the unknown. I’m not sure I can help you any further. Indeed, this would seem clear. What I was trying to point out is that your graph is rather misleading. You make it seem as though the it has warmed far less than would be expected, given the change in atmospheric CO2, despite it actually having warmed roughly in line with what would expected. If you’re going to present a graph like that, then the two y-axis scales should be consistent (in the sense that if there is some expected relationship between what is on one yaxis and on the other, then the scales should be consistent with that relationship). Yes, the point about the two axes has been made by others, and it’s a fair point too. I myself wrote an essay a couple of years time ago about the way in which the same data can be made to give different appearances by the way they are presented graphically. Nonetheless, I do not find persuasive your suggestion that warming is occurring at the rate that might be expected, because it relies not only on your expectations but also on too many assumptions. No one seems to deny that CO2-induced warming is logarithmic in its effect. If that is the case (and we all seem to rely on Callander) there is not much warming left to come from that cause. If warming continues at a steady rate then I have to accept that it comes from some other cause or causes. Or that the rate of CO2 rise isn’t linear (and it isn’t, and there’s no reason to think it should be). Have you read Dr Edwin Berry’s preprint “Why human CO2 does not change climate”? His preprint has been in review at Elsevier since October 2017. At May 2018 Elsevier has not received a request for clarification or an objection from a peer reviewer. It continues to be reviewed. If you’d like to read it, please email me. How can human carbon dioxide, which is less than 5 percent of natural carbon dioxide, cause 30 percent of today’s atmospheric carbon dioxide? It can’t. Present human emissions add an equilibrium level of 18 ppm, which is the product of human carbon dioxide inflow of 4.5 ppm per year multiplied by the carbon dioxide residence time of 4 years. Present natural emissions add an equilibrium level of 392 ppm, to get today’s 410 ppm. If human emissions continue as at present, these emissions will add no additional carbon dioxide to the atmosphere. If all human emissions were stopped, and nature stayed constant, it would remove only 18 ppm. The natural level of 392 ppm would remain. Unfortunately the key point is that, N.B. The flow of GHG’s into the atmosphere is NOT constant. It is increasing. The flow of GHG’s out of the atmosphere is NOT constant. Sinks are becoming saturated. “IPCC (2007) estimates the carbon dioxide flow from land to atmosphere is 56 ppm per year, and from oceans is 42 ppm per year, for a total of 98 ppm per year,” [He provides no usable reference]. However the flows from land have increased since 2007 (9.54 Gt/C) to 2016 (11.15 Gt/C). although there may be some “out gassing” due to warmer ocean temperatures. This creates a rising CO2 after a heat increase, not a rising heat after CO2 [the real issue]. Chris, without going into the detail of your response, I was struck by your remark that sinks were saturated. Who says so, and how do they know? The satellite photography shows that the world is notably greening, especially in the semi-arid regions like the Sahel. The cause is presumably more CO2 in the atmosphere, encouraging greater growth in plants. The main sink is water not vegetation which emit CO2 during night time. The essential point is that more CO2 means more plant life, which is good for us all. I don’t understand. Are you implying New York Times makes unfounded suggestions? Vegetation is not an adequate net sink. Most CO2 absorption (sinking) is water. The impact of vegetation is already accounted for in land use change within existing carbon budgets and still CO2 concentration rises at an accelerating rate. There are plenty of other corroborating resources on saturation if you run your own internet queries. You certainly have a bad habit of shooting messangers. And come to their own informed decision. There was a comment on the Science Show that floating diatoms fix more carbon than all the worlds rainforests. Chris, I don’t shoot messengers, and you are not one anyway. You are a disciple, a believer. It doesn’t matter what evidence is put in front of you, you will find an objection to it or some other factoid or story that makes you feel that you are right after all. If the oceans are warming up, then they will be releasing carbon dioxide, not taking it in. The amount of heat involved is hard to measure, and most diagrammatic examples I have seen show ocean uptake and degassing to be of the same order. What can’t be denied is that there is more plant life than there was and more vigorous plant life as well, because of greater CO2 levels. It looks as though there is a ready capacity for the biomass to accept and use increased amounts of the gas. It would follow, I think, that the notion that the plants represent a saturated sink can’t be right. I am open to argument and evidence, as on anything, but stories in the NYT don’t work for me. Indeed, everything I have seen in this area rests on estimates and guesses. If you can find something really hard, data-based, no models, and accessible (no paywall) then you may find a readership. Go on believing, Chris. It’s obviously important for you. I’ll leave you in peace to ponder on the coming catastrophe. Blith, being immersed in your belief system, as you are, always never forget to remember that in many billions of years the earth has yet to encounter a “tipping point” that all you enuresistic disciples of “whinnying jimmy” embrace as your primary instruction by your primary instructor. When people start using words like disciple, factoid, I quickly assume they are the ones coated in this muck. But this is a claim with no evidence, so is more likely to be a factoid waved out of context. The context is that for GHGs to cease rising, then the ocean uptake must be greater than the degassing. So it seems you have pointed to the problem, not the solution. Was that your motivation in doing it yourself in this essay? Were you hoping to persuade people less trained in data analysis? No motivation. I have a large collection of graphs and fossicked around it quickly until I found one that would do. Speed and lack of thought were the villains.